Never have I read a book where I bent so many page corners to remember the wisdom that lies within. It is rich in texture & authenticity from the very first page. The 3rd sentence mentions forgiveness of the prison guards he is being tortured by. 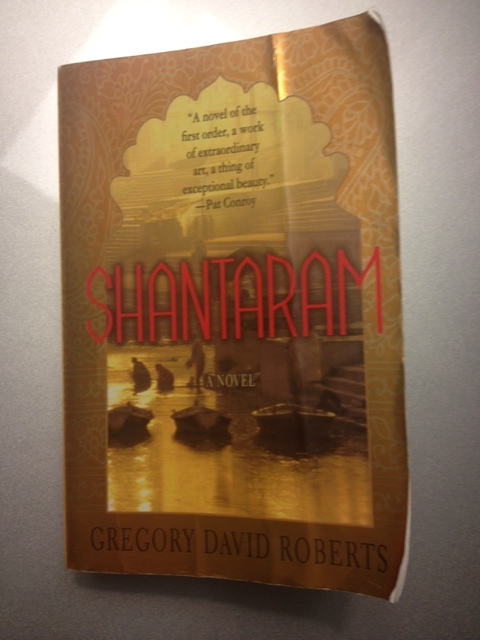 Gregory David Roberts is honest in describing his own betrayals of others as well as those (we are surprised to discover) who have betrayed him. It is 933 pages that literally fly by because his life was so exciting, full & interesting. I finished & found myself wishing it was longer because I hated to end all the relationships. Of all the books I’ve read about India this is the book that gave me the feeling of knowing a new place & discovering the hearts of the people. One character says “This is India. This is the land of the heart. This is where the heart is king…” Reading this novel, helps you understand how true this really is. There is a real power to his thoughts on forgiveness. He says it is forgiveness that characterizes the human race. I’d add the inability to forgive ourselves or others. The human race is characterized by both polarities. The author also acknowledges how bad it is loving someone you can’t forgive. I’ve been a witness to that truth many, many times over the decades. People work with me to understand they have part of the responsibility, in the sin of their silence. It’s not enough to lead to repair. There’s not enough heart to work at restoring trust because people are buried under layers of unspoken betrayal. Betrayal is always about the lack of hard truths between people who are loved. This impacts everyone in the novel. There is a lot of authenticity that he brings to the pages because it’s about his life living in a slum, surviving prison, escaping from prison in Australia, starting a medical clinic, working for the Bombay Mafia, going to war in Afghanistan & being hugged by a bear. I loved how three-dimensional he is; smart, afraid, foolish, stuck, brave, open & with hard-won wisdom about life and his own mistakes. It is a glorious moment when he forgives someone who admits their jealousy of him because he recognizes they are the same; for he was very jealous of this man for a very long time. When he is able to forgive himself he becomes so much more able to forgive others. Isn’t this true for all of us?